I just realized that I had not made a separate download page for Splashing Water. I placed the download in a post on April 4. Someone mentioned to me that they couldn’t find them, and they are correct; it is difficult to find the download. Actually, there are two downloads. One called PIX Splashing Water and the other called P11 Splashing Water. Why two downloads? Well, when I make brushes in Painter 11, they are not backward compatible to earlier versions of Painter. David Gell, an incredible brush master for Corel Painter, has a way of making the brushes backward compatible, and he generously makes them compatible for me. However, this time, there were two brushes that were using the Hard Media brush engine, which is not backward compatible. To correct the problem, David changed the two brushes in a way that it is impossible to differentiate between originals made and the ones that are backward compatible. So what does this mean to you? When you click on the link below, if you are using Painter 11 select the P11 Splashing Water brushes for download. If you are using Painter IX or X, then select the PIX Splashing Water Download. If you have all three versions, then PIX Splashing Water will work for IX, X or 11. Or shoot, if you like, just download both. Either download is compatible with Painter 12. There are two videos that are 10 minutes long and show a bit about how I envisioned the use of the brushes. However, I find that folks use them in very different ways than I expect, which is great. I love to see what folks do with the brushes. If you would like to see the videos, go to the post for April 4, 2011. I hope you enjoy them. Thanks for the pingback Karen. I love the way you use my brushes. Your creativity knowns no bounds. Hi Karen, I did get the pingback. I approved it and made a comment, but I guess you don’t get a notification that I did. LOL…we will figure out this pingback yet. Thanks again for linking to my site. Thanks for the pingback. Love your site. I have checked all the downloads and corrected any that had expired, which they shouldn’t do. Anyway…all is well now and you should be able to download Splashing Water. Real Watercolor 2 was also expired and has been fixed. I have run across something that I am not sure if anyone else has a problem with. I have two sets of splashing water brushes. One set works fine the other one shows up under brushes in some type of black icon, similar to the brushes from Snow Time. When you choose one of them there is no varient and the program says no library, are they part of Splashing Water? Snow Time and Snow Time 2009 are two brush categories created by David Gell; they are not part of Splashing Water. I provided two downloads for Splashing water, but you would only want to use one of them. If you are in Painter 11 or 12, then use the one for Painter 11. If you are using Painter X or IX, then use the other Splashing water download. To answer your question, I need additional information. Please tell me the operating system you are using, what version of Painter you are using, and write out the complete path showing where you have installed the brushes. With that information, I think I can help. I’m still waiting on the complete path showing where you installed the brushes. I really need that to help. i WILL GET IT TO YOU SOON. I HAVE BEEN SO BUSY. BUT SOON, SOON! That is great news; I am glad it is working for you now. Hi Skip — I’m really enjoying the Splashing Water brushes. But, today I used the Digital Closed Splat, first, it comes out in its own color, and then when I decided I didn’t like the effect, because I’d gone on and done a bunch of other stuff, I couldn’t easily just step back and take away those splashes. So I tried erasing, painting over it, blending it, etc. Nothing worked. Can you help me? I am sorry you are having trouble with Digital Closed Splat. I am not sure I am going to be able to answer your questions based on the information provided. 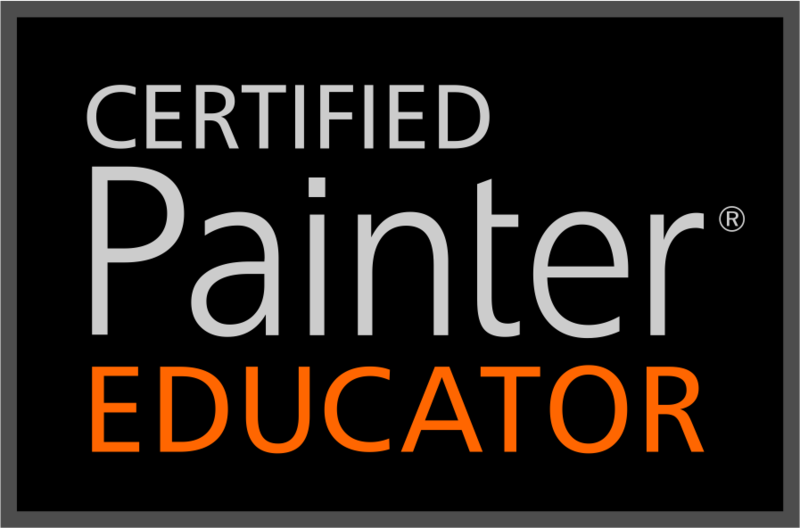 When asking it really helps to know what version of Painter you are using, are you on a MAC or PC, what operating system you are using, and your tablet type. Another critical point is whether you are working on the canvas layer or another layer, and if the digital watercolor has been kept separate from other brush variants, like chalk or oil. But, let’s see what we can do. 1. It comes out in its own color. The first time you select the brush, it will be in hot pink…sorry about that…but then when you change the color, and then go to another brush, when you come back to the Digital Closed Splat, it should be the color you last used. Unless you change brush categories or close painter and re-open, then you are back to the pink. 2. Now that you have made the strokes followed by a bunch of other strokes from different variants, you were not able to undo without losing what you had done…so you tried erasing, painting over, blending, and nothing worked. Yikes, this does surprise me. I am able to do all of the above provided I haven’t dried the digital watercolor layer. I can still erase even if I had dried the digital layer. 3. If the digital layer has not been dried. You can use Skip’sDigitalH2ORemove to take away the splats. You can find the brush in Skip’s Digital Watercolors. This variant is pressure sensitive, and the pressure is set at 85%. You may need to increase the pressure to 100% and apply heavy pressure to erase completely. If it does take heavy pressure, then you may want to adjust your brush tracking settings. In Splashing water, there is a variant called Digital Square Diffuse. This brush will cover or blend out the Digital Closed Splat marks. However, again the variant is pressure sensitive. Light pressure will allow the splat color to show through, but heavy pressure will not. Please note, until you finish the stroke, you will still see the splats, but when the diffusion comes into play, you will not. Almost any eraser should work. You could use the eraser tool, the flip side of your stylus or I use Eraser > Real Soft Eraser almost exclusively. But, again, watch your pressure, it can make a difference. 4. If the digital layer has been dried, Layer > Dry Digital Layer, then you are reduced to using an eraser. The three I mentioned above should work well. OK…that’s all I can think of. Please let me know if anything worked. In the future, you may want to work on multiple layers. That way, you can easily delete a layer that you do not like. Thank you so much for your detailed answer! It’s a little late, but I’m running Painter 12 on a PC with Windows 7, My tablet is a Wacom Bamboo Create. I’ll try the things you suggest. This program is very complicated! I’m pretty skilled with Photoshop, but there are so many variables in Painter. I’m taking a class, so I hope by the end of 10 weeks I won’t need to ask dumb noob questions any more. Glad to be of help. I see you are using a Wacom Bamboo Create. I know others who have used a Bamboo tablet and loved it. It is less pressure sensitive than the intuos models, but still very usable. But since it is a little less sensitive to pressure, that may be why you were having trouble with the brushes. They are very pressure sensitive…so you may have to press hard in order to erase. You think Painter is complicated…LOL…I think Photoshop is complicated. A friend once told me when I asked her why she would run back to Photoshop to do things that you can do in Painter. She replied that Photoshop is her first language and she is more comfortable there. It struck home to me that I am more comfortable in Painter than Photoshop. I could not find the videos for Splashing Water on the April post. Please advise. I don’t know what to tell you. The videos are right where I said they are…April 4, 2011. Maybe you looked in the archives list under April 2012, or April 2010, but not April 2011. Take another look and if you still can’t find them, let me know.